Russian democracy and civil rights activist. Member of Bureau of Federal Board of Solidarnost (“Solidarity”) united democratic movement. Director of the Anti-Corruption Policy Lab’s Discussion Club at the Higher School of Economics (Moscow). Oleg Kozlovsky was born on May 8, 1984 in Moscow. He graduated from the Department of Computational Mathematics and Cybernetics at Moscow State University in 2006. In 2008, he received M.A. in Political Science from Higher School of Economics in Moscow. He is currently working on his Ph.D. in Political Science; its topic dedicated to non-violent political conflicts like “velvet” or “coloured” revolutions. He joined Amnesty International in 2000 and soon was elected Spokesman of its Moscow Group. From 2001 to 2007, he participated in the Union of Right Forces (SPS) political party and held various positions there including the Co-Chairman of SPS Moscow Youth and a Member of the party’s Moscow Board. He also represented SPS in one of the Moscow’s disctrict electoral commissions. He resigned and left SPS in April 2007 in protest against the party’s leadership taking too conciliatory a tone with the Kremlin. He organized a public action in support of the Orange Revolution in Moscow in November 2004. This was one of the first actions that brought together all democratic forces. In March 2005, Oleg Kozlovsky was one of the co-founders of Oborona (“Defense”) youth movement and was elected as its Coordinator in June. Oborona’s goal is to establish a civilized, democratic political system in Russia. It declares that the current government’s policy of establishing a corrupted authoritarian rule is extremely dangerous for the future of the Russian people. Oborona uses non-violent civil resistance as its main weapon. In October 2010, Kozlovsky stepped down as a Coordinator to give way to the younger activists. In March 2006, he participated in the “Jeans Revolution” in Minsk—a protest against rigged presidential elections in Belarus. He was arrested during the crackdown on the opposition’s tent camp, spent 15 days in jail on Okrestina Street and was included in the list of “people, who pose threat to the national security of Republic of Belarus.” He was banned from entering the country for one year but even three years later, in March 2009, he gets deported from Belarus by KGB. Oleg Kozlovsky was one of organizers of the Dissenters’ Marches and Dissenters’ Days—the largest opposition rally in Russia. He has been arrested more than 20 times for preparing and participating in these and other peaceful protest rallies. He participated in the Political Council of the Other Russia opposition coalition since November 2006 and joined the coalition’s Executive Committee in the summer of 2007. He was arrested in November 2007 for participating in a Dissenters’ March and detained for 5 days. In December 2007, Oleg Kozlovsky was drafted illegally into the army with the assistance of FSB. A civil campaign in his support ultimately led to his release on March 4, 2008—two days after the presidential elections. The appartment that he was renting and Oborona was using for gatherings and storing literature was stormed by the police in March 2008. Kozlovsky and about 10 more activists were beaten and arrested. The appartment’s owners were later forced by the police to break the rent contract. 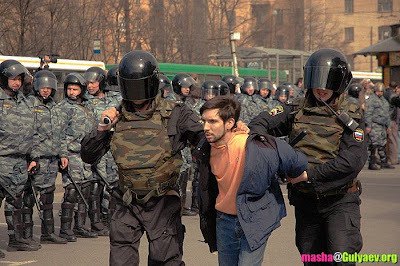 Oleg Kozlovsky was arrested once again in May 2008, a day before the inauguration of Dmitry Medvedev, charged with participation in a Dissenters’ March and sentenced to 13-day detention. He went on a hunger strike in protest; Amnesty International declared him a prisoner of conscience. Months later, he was cleared of the charges and the government was ordered to pay the compensation (which hasn’t been paid). In spring 2008, he participated in founding of the National Assembly of the Russian Federation—a “proto-parliament” that united virtually every non-system political and civic organization. He was elected in absence (he was serving the detention term at the time) a member of Council of the National Assembly at its founding congress on May 17. Oleg Kozlovsky participated in organizing committee of the united convention of democratic forces, which took place in December 2008 and founded Solidarnost (“Solidarity”) united democratic movement. Oleg Kozlovsky was elected as a Member of the movement’s Federal Board’s and a Member of the Board’s Bureau. He received the Human Rights Award 2008 from Human Rights First in October 2008. In 2010 was a Draper Hills Summer Fellow on Democracy and Development at Stanford University. His articles in Russian and in English have been published by The Washington Post, RobertAmsterdam.com, Huffington Post, Ezhednevny Journal, NaZlobu.ru etc. He maintains an English and a Russian blogs about democracy and human rights in Russia and tweets in English and in Russian. Is there anything we Westerners (USA) can do to help your movement? Hi Derek, and thanks for your comment! One thing you could do would be to write a letter to the editor of a major paper or to your representatives in Congress calling for action in protection of civil rights in Russia. You could make financial contributions in our name to groups like Human Rights Watch or Amnesty International. Support political leaders who call for opposition to the rise of authoritarianism in Russia. If you want to get more involved, send me an e-mail, I can offer lots of suggestions. One thing that would be great would be assistance in arranging visits to the U.S. by Oborona members to learn more about the defense of civil rights and to educate Americans about our group and its activities. We could in turn host return visits, so that Russians would see that they do not stand alone. I also wish you well & would like to help. There’s very little information on US television about this issue, and I suspect few Americans know about it. Would it be helpful to Oborona for people in the US contact news networks like CNN and Fox and ask them to run stories about your struggle for civil liberty, and possibly interview you or other members of Oborona or Other Russia? This blog is a great Idea. Until I heard about your meetings and rallies, I thought everyone in Russia was blinded/feared from Putin’s marionette state! I’m just a student from germany but I’d like to help too in any way possible. I was part of the Kmara! movement in Georgia in 2003. Hi, Oleg! I am an Amnesty Int’l member since 1993, with a focus on Russia/Eurasia. From my experience, Amnesty gives not enough attention to Russia’s shocking cases such as prisoners of conscience and Chechens as asylum seekers and victims of this “The Dirty War” as Anna Politkovskaya calls this terrible genocidal war under pretext of “terrorism”. I am so glad that you are in the Amnesty! I know you can’t participate in campaigns concerning Russian cases but we can exchange information about the issues that need to be brought to Amnesty attention. Also, we can exchange information on Russia’s realities. But I’m not a member of Amnesty International now. I left it in 2002 because I couldn’t see how it could help us solve the problems in Russia. If you could email me with some hints about how you made this site look this awesome, I would appreciate it!